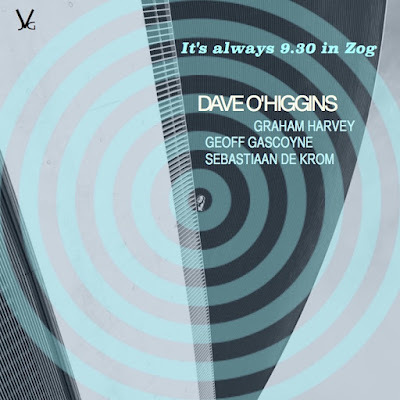 Dave O'Higgins has produced an album of energetic hard bop: even the back of the CD case pays homage, looking just like a Blue Note album from the label's classic period. His quartet of Geoff Gascoygne on bass, Graham Harvey (piano and Fender Rhodes) and Sebastiaan de Krom on drums romps through a collection of originals with a couple of covers, full of dynamism and, where needed, subtlety. O'Higgins' tenor saxophone playing is fluid and muscular; on soprano, he positively skips along. The CD gets off to a flying start with the title track, the tenor packing a punch as the quartet swing along. Some pieces have a more Latin feel. On Alien With Extraordinary Ability - referring to the type of visa that allowed O'Higgins to play in the USA - Harvey's Fender Rhodes introduces a lighter touch over a samba, whilst de Krom's propulsive brush-work drives the tune along. Harvey uses Fender Rhodes again on Morpheus, giving a suitably dream-like backdrop to O'Higgins' tenor. One For Big G, dedicated to George Coleman, features the soprano. The tune trips along at a pace, giving O'Hiigons ample space to solo. Bheki Mseleku's Timelessness comes over as a slice of Atlantic-era Coltrane; one of the faster numbers, O'Higgins lays down a complex tenor solo before Harvey's solo goes all over the piano at great speed. It's an apt title to include on the record, because it does feel timeless. The CD closes with one of the slower numbers, the standard Easy Living. A gently paced, rather lovely, bluesy ballad, O'Higgins shows his more soulful side, opening the tune with just his tenor and Gascoyne's bass, with just a hint of de Krom's brushes. O'Higgin's solo has both warmth and sadness - a fitting end to a fine CD.